Circle March 18, 2016 on your calendar and make plans to join the Illinois Wood Utilization Team for the inaugural Bringing the Urban Forest Full Circle Conference. We’re beyond excited that Hamburger University on McDonald’s Corporation’s iconic campus in Oak Brook, IL, will host the event. In addition, McDonald’s has agreed to donate some of the ash trees it is losing to the emerald ash borer, some of which will be used for a portable sawmill presentation during the conference. The Illinois WUT conference committee is developing a conference that will focus on industry best practices to convert trees, including those infested by the invasive emerald ash borer, into lumber that can be reincarnated as furniture, cabinets, flooring, etc. 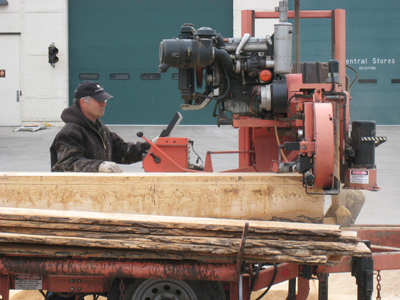 The conference will provide a unique networking forum for bring together stakeholders from all links of the chain – land managers and arborists through sawyers and woodworkers. Additional conference and registration details will be coming soon, as will information about sponsorship and exhibit opportunities at IllinoisUrbanWood.org. Not only do we hope that you will plan to attend, we ask your help in sharing this link – Bringing the Urban Forest Full Circle – with land managers, arborists, sawyers, woodworkers, retailers, members of the A&D community and anyone else you know who might be interested in taking a front row seat on the ground floor of the urban wood market. For additional details and inquiries, contact Rich Christianson, conference director, at richsonmediapro@gmail.com or 773-822-6750.